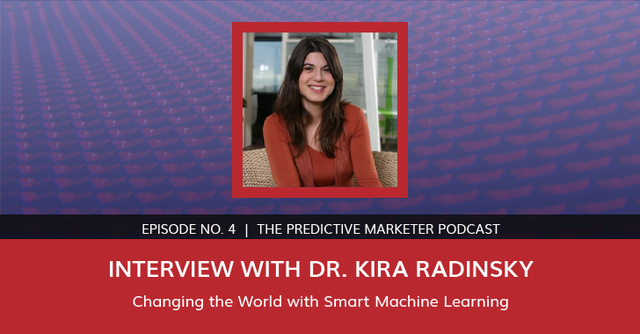 In episode 4 of The Predictive Marketer we're joined by Dr. Kira Radinsky, CTO and Co-Founder of SalesPredict, where she is pioneering artificial intelligence-based, predictive analytics solutions that transform the way companies do business. Kira was recently recognized in Forbes' "30 Under 30 in Enterprise Tech". She was also named to the prestigious “35 Young Innovators Under 35” by the MIT Technology Review. Forbes named her one of the 50 Most Influential Women in Israel. She is a frequent presenter at global tech and industry conferences, including TEDx, World Wide Web, and INBOUND. We discuss the rapid growth of SalesPredict, their automated algorithmic updating which enables more accurate predictions for their clients and enables SalesPredict to scale. We will discuss Kira's view of the future of marketing and SalesPredict's very successful pro bono work utilizing machine learning algorithms in cancer prediction. Steve: Perhaps you could start us off with a story. How did you get in to data science? Kira: Well, it's a unique story that I never expected to be in data science. My dream was always to be a doctor, a medical doctor. And I was just like passionate about how can I change humanity? How can I make a change to the world? We live not for a long time and how can I actually matter? And this is why I was so interested in medical devices and medical treatments. And when I was fourteen, I went to a summer camp which was an international one in [01:57?] and they got a lot of people from different places. And what I was doing is research about how natural compounds affect the proliferation of prostate cancer cells. I must admit that part of the job was actually getting the cancer cells and [laughs] it was very interesting to understand where you need to gather it from. And my job was actually to feed those cells every day, do statistical analysis, sometimes to see if the amount of different components would actually affect them or not. And I had one job of making sure they do not die from some infection. You're going to put your hands inside like an incubator and you feed them. And the most important thing is not to touch them while feeding them. And of course, I did that and I pretty much killed all our cells in the entire experiment we did. And after that, [laughs] the only mission they would give me is actually doing the statistical analysis behind the scene and actually counting how many cells we had every day. Just to give you some perspective, it was like around 80,000 different cells that you need to count. And you need to count them manually through a microscope. I pretty much thought that it was the most horrible idea ever to spend my summer actually counting cells every day. And I wrote my first image processing algorithm to actually count how many cells there were and I went to the [? 03:20] [laugh] I think it was the most miserable experience ever. But the good thing is that I found something I really enjoyed. It turned out that doing the statistical analysis, the different understanding. Even doing the image processing behind that, I became very intrigued because I was reading a lot about how the body behaves and I saw a lot about that in different machine learning algorithms that happen. Of course, many years after, I understand that there's almost no connection behind it. But that's what made passion in the beginning. And more than that, while I was seeing how experts, scientists, actually doing their research, I understood that, well, there's a lot of missing automation statistical analysis that we can do there that can make the discovery so much faster. Because we have so much of this information over the world that just taking all these data available, we can make discoveries. No in years, we can make these done in months. I can even say we can make them in days. Think about how much analysis of the different blood that are being taken from people. So at least in Israel, we have a huge storage of eight million people -- at least four million people since the seventies -- of different structured data about people. And we can make so much analysis about that; about different probabilities about cancer, diabetes, all types of different diseases. And instead, a lot of the different sciences, the way they do it today is very much manually, very generously touching the data, understanding it, doing very short analysis and checking of live animals. What I think is we can build an entire system that crunches all these data, feeds, news articles, reads different published articles around that makes those discoveries. So this would guide me into getting more into predictions and future predictions as well. One of the first discoveries I had made was trying to predict proliferation of cholera. I was working in Microsoft Research and my manager was in touch with the Gates Foundation and he suggested that we tried to predict malaria. Unfortunately, we couldn’t predict malaria but we did predict cholera outbreaks. And it turned out that if you take all the news articles since 1800s to today, and you apply deep semantic analysis on them and you build algorithms that look for patterns in history, abstract them with human knowledge from Wikipedia and other data, eventually, you can find an interesting pattern about cholera. And what we've found that is if you have a drought and two years later you have storms, the probability of cholera is very high. Specifically in countries with low GDP (which is not surprising) and low concentration of water. We actually improved this model when we got to a point where different NGOs can actually send clean water in time a few months in advance when they identifies this pattern. We applied the same thing for riots, [? 06:30] the Sudan riots. We even managed to find patterns in genocides. Well, everything was very negative as you can say [laughs] because the news usually discusses only negative things. Kira: And one day I was thinking that, you know what would be really cool about using my system for something really useful? Predicting iPad prices because I wanted to buy an iPad. And what I did, I put iPad prices into our system and the system said that iPad prices are going to go up. Well, this is a significant discovery, not like cholera. Kira: And it turned out that the pattern that we've found in the past is that if you have a certain tsunami in Japan that affects the factory that then sends other material to another factory, that those factories make the iPad. And this is what got me interested in applying those predictive analytics mostly in economics. And this is how SalesPredict pretty much started. I was thinking, “Hey, we have all these future prediction technology, how can we apply, actually, mimic economics?” That's pretty awesome, right? Steve: That's an amazing story. Kira: And this is what we started almost three years ago. And since then, besides having all these massive data sets that we mine all the time, we're also combining it with internal data of companies trying to predict who’s their most valuable customer. And I think my biggest passion in the last few years has become from only predicting the future to actually advancing an entire field with data science. We call it automatic data science. Google has put a lot of effort on it in the last few years. And it turns out that you can build models, statistical models, almost in an automated way without no loop, with no expert in the loop. And this is what we do: we build an entire array of algorithms, understanding customer’s data and data coming from all over the web, to build statistical models that try to predict their future customer’s churn. And additionally to that (and this one is one of the most things I'm proud of), giving full human-readable explanations. Because what I've found out is that when I was saying, “Hey, I think the prices are going to go up,” and not explain it, I wouldn’t even believe that. How can you even tell an NGO to send clean water to some cholera place if they don't know why? It turns out that real experts – whether it's doctors, politicians and even people, themselves and decision makers – do not trust black boxes. And we put a lot of thought and effort in what we do today in SalesPredict. And I'm pretty proud to say that, well, yeah, when I was 15, I was trying to find the cure for cancer and today, we are leveraging all these knowledge to something not even as big as that. We're doing it for economics, we're applying pro bono some of those models for cancer for the entire community here. And I really feel proud about what we do today. Steve: Let’s talk a little bit about SalesPredict. The company has been growing rapidly; how much has the company raised in venture funding? Kira: We raised, up to date, eight million dollars. Steve: Fantastic! This year, you’ve been experiencing a hundred percent quarterly growth and actually tripled your revenue during the first quarter of this year. I'm curious, a year ago, if you were to do a search on predictive marketing, you would not have found much but today that's not the case. Can you explain why we're seeing such an explosive growth in the B2B predictive marketing space? Kira: Definitely. I think that for a lot of organizations, the understanding that they have crucial data that can help them drive their business and get to a point where decisions are being data-driven, is becoming even more crucial today. If we think about all the CRM systems and how they may help you create a process inside your organizations, they did something even more behind the scenes -- they kept that data in an organized way. So at one point, the technology and data of the companies became ripe for such technologies. And when the first successes started being held in those industries, more and more people started using it. And I think it’s mostly again because of the data availability inside the companies about their previous wins and losses. And even more than that, how much public data you can get about companies, people, their different behaviors in the web that we can use to correlate eventually with historical wins and losses of those companies. I think this field is going to even grow more and more. Western Journal had a huge article about that recently talking about how sales people that walk from mad man to math man. And it comes also from the customers. A lot of customers are doing a lot of their sales on their own and we just need to know when to intervene in the middle. And when they hear numbers, they wanna know why. And you cannot waste your time when somebody was irrelevant. It became such a dynamic world in the way sales is done change and shifted so much that marketers have to be much smarter than that. 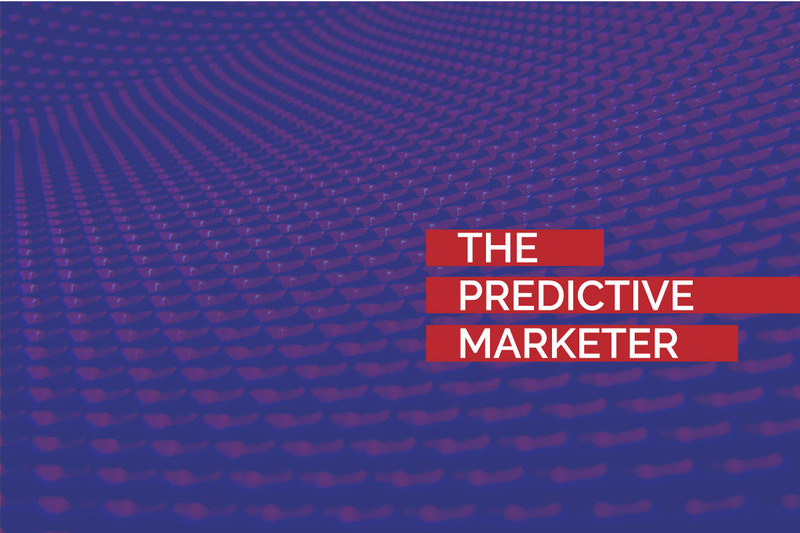 More than that, the addition of the amounts of money in this field, I think there's been $400 million investments in predictive marketing, specifically in the last year and a half, if not two. All of those pretty much created a good atmosphere for companies to understand the need, the quality of the quality of results that they can get from that and the results talk for themselves. Steve: Obviously, there's a lot of companies that have entered the market space; how do you think this will play out? Can the market support them? What are your insights into this? Kira: There is a lot of need for predictive solutions. The question is, which one is going to be the winner? And currently, there's no significant winner who controls the market. Almost in all B2B technologies in very similar fields, you see that there’s one winner that takes seventy percent of the market; number two takes twenty percent and the rest are fighting for the last ten percent. I think this industry is no different and something very similar is going to happen. Today, all those companies are so young. You know, Lattice, Lattice has been much longer in the field coming from a very different direction working more in a service mode, actually selling you a service and a data scientist working specifically with you. But I think that eventually, this would happen in this field as well. And the most important thing is beyond being the best algorithm, the second most important thing is how can you scale? How can you actually build a product without a human behind it? Without a data scientist assigned to almost every customer? And getting into a point where all of these is explainable and can be used by non-expert. I think this one is going to be the key features to actually understand who's going to be the main one leading the market. And of course, execution which is very correct almost in every B2B startup. Steve: Can you kind of shed some light on the things that sales predict is doing differently than competition? Kira: Definitely. What we learned is that building one model and giving it to a customer does not scale. It becomes stale superfast because the way they sell changes, their competition is changing. And as we’ve talked about it, the market is so dynamic and we had companies that the model has become [15:04?] after almost a couple of months. And what we did behind the scenes was actually getting into a point where you have a completely automated solution that looks at your wins and losses all the time, always tries the information about them, builds the model and pushes it to the customer. So this happens in a weekly basis, just to show you like how dynamic it is. In addition to that, the installation itself is less than five minutes. You just install it. There's no data scientist behind the scenes sitting and actually verifying and overfeeding some of these data. So this is one thing. Actually getting to a point and there's a lot of statistical problems around this. How do you find linkages in the customer’s data? How do you understand that what you did is not over fitted? All of those we have statistical tools to verify completely automated. The second thing, what you’ve referred is emotional artificial intelligence is something very recent is I've realized this a few years ago, there's a lot of research going on around human computer interaction that's been discussing very similar things is that eventually, when you have the doctor and you’re giving him some prediction, this person is going to have cancer, the doctor is not going to follow the system if he has a different gut feeling and he doesn’t understand it because it's life or death. For sales, it's also life and death. Eventually this a deal that can be super important for their company. And not understanding why it scored high or low is something that even the school is super precise, the probabilities are really good, people are not going to use it. And understanding how human and a computer could actually work together is essential in any predictive model. And I think our industry is only the beginning around that, to get to a point where everything is explainable and additionally, it can drive action. Giving you a prediction for something that you cannot adjust to, so for example, I can show you you're doing really well with companies with more revenues. You cannot go to a company and say, “Hey, have more revenues,” in order to actually upsell them. There's different things you can control of and the model should be rebuilt in a very actions and not only to give predictions. Steve: Your system has to build confidence in the users. Is that correct? Kira: That's true. Let’s go back one step; automated algorithms, that is a tool that you’ve built into your system that gives you a competitive advantage. Is that an accurate statement? Steve: What is the most exciting aspect of the work that you do? Kira: I think the ability to get the completely automated statistical analysis and building machine learning algorithms that do not need support of a data scientist in-between is just amazing for me. Because if you think about how artificial intelligence should advance forward, if we always have somebody behind the scene building the models and discovering new hypothesis, it's not going to scale. We actually need to go bigger. And the moment that we're actually building a computer algorithm that can learn himself, without the need for me, for somebody else to give them a hypothesis, he actually discovers those hypotheses themselves, that's amazing! Well, I wouldn’t say the singularity, but I think of this is one amazing stuff that we need to take forward, specifically in artificial intelligence. And that's what pretty much drives me. And I think that in general, getting into a point where decision-making is drived by scientific discoveries is something we should always strive for. If you think about it, doctors are making decisions today based on gut feelings; politicians are driving entire countries based on gut feelings. And if you talk about companies, company CEOs themselves, again, do this by gut feeling. I don't think I decided what to eat today without doing some statistical analysis of that. And getting to a point where we have the tools and easy way of using them, that's pretty much how I imagined the world should be. And this is what's exciting for me. Steve: Let me ask you this, staying on the topic of B2B predictive analytics and predictive marketing, the companies that are implementing predictive marketing today have a competitive advantage, no question about that. How long before a company will need predictive marketing just to remain competitive? Kira: That's an interesting question. Let’s look at different alternative. Let’s look at algo-trading and how it was done in the past. In the past, trading was done mostly by humans, right? You would go, you’ll decide which stuff works and which doesn’t. And today, I think the numbers say there are at least 60% of different traffic in trading is done by machines. So still, the machines can calculate really fast which stock to buy, which doesn’t; they can reflect them what the crowd thinks or what doesn’t. And the thing that many companies who are not going to do that are going to be left behind. I think that in the past, when I was working in Microsoft, one of the things I noticed about is that when you have certain data, you started building a full monopoly around what you can and cannot do. If you think about the algorithm that Google has, they have an amazing algorithm that were really the first one. But today, because they have so much data of what people searched for and what they clicked for, even if I come with a much better algorithm, without those data, it would be super hard for me to scale and get to similar results like Google. So at this point, they have full monopoly on the search area. And I think very similar things is going to happen in predictive marketing; people are going to have the data and the abilities to be faster and more precise. And are going to have certain monopolies in their field because they're going to get to the customer source, they're going to be much better than their competition. And the first one who gets to it is going to be the winner. And we said in many B2B businesses, especially today, there's one winner who takes 70%; 20% takes the second one and the rest are fighting for the 10%. And I think companies who are not going to be focusing on how to make their business and execution in a more scientific way might end up to be number two. Steve: I agree. Yeah, that makes sense. What has been your biggest challenge at SalesPredict? Kira: So I think my biggest technological challenge was to build algorithms that can explain themselves. So machine learning community is mostly machine learning, people who are coming from computer science and mathematicians. Nobody was actually thinking about how can it be used to a way a human would do it and we're all optimizing for precision. But today, what we're trying to do is not only optimize for precision but also for interpretability, for people to actually understand why [? 21:56] that we have. And this was the biggest technological challenge that we did. Steve: Interesting. Let’s talk about the future of marketing and you know, specifically, how do you see things changing over the next few years? Kira: So the way I see it is that today, we have data and everybody was working till today about building better data and reaching this data. Today, I think the main focus and again in the beginning is building predictions on top of this data. And I think the next generation is going to be building algorithms that work on top of this predictions, that work on top of this data. And I'll describe what I mean is the fact that in every point, there's going to be a different type of algorithm deciding what would be the best way to approach Steve. They're going to be deciding different text to show Steve, based on the prediction of what are going to be following certain types of market or not. I think that even as a society, we need to think about vocations locations of that. There's an interesting study in the journal of a comic review that described the things that algorithms are actually discriminating. So let’s say for me, there's much more chances of me getting an advertisement for an executive role of $200,000 or more compared to men. And if you think about how algorithms work behind the scenes, they optimize for precision, not diversity. And I think that we're going to have a lot of social inclinations because of that. Think about… let’s say we have a minority and a majority; the majority we're studying mostly the smart ones went to finance and them minority of the smart ones went to math. If you build an algorithm that's going to say “smart people go to finance” it's going to be right most of the time. But it's discriminating against the minority. And the reason for that is the way we build those algorithms. The interesting thing would be to think about how we build an entire society that lives with those algorithms working in parallel to us, to the human layer. And we need to build a different social understanding of them and actually give them the same social benefits that we think the world should work by. So I think this is the different inclinations for marketing in the future. Steve: I know you're very passionate about the work you’ve been doing in the medical community with this technology; can you tell us a little bit about that? Kira: I'm building research in Israel about structured data and applying some algorithms in the same field that we're working on today on medical data, trying to predict cancer. And I think this is one of the things, us as a company, are very dedicated to. We're really good in building predictive algorithms. And we're really good in applying them in the predictive. And we give the benefit for people here to also contribute to the community. And the best way we see it is to contribute our data science knowledge. And what we do today will build models for cancer and diabetes and trying to push personal medicine one step forward, mainly working with the different HMOs here in Israel. Steve: And how is that going? Kira: One of our first models has been already approved, meaning they already validated it works well. And it goes for second stage of smaller validations and the moment it's going to be completely validated, we hope it's going to be fully activated for all the people here in Israel. That's going to be predicting whether they're going to have types of cancer before and being called to meet a doctor, just pretty much based on their blood tests. Kira: It is. This is what's exciting for me is that I came for a reason to the statistical analysis and data science and computer science and I'm just glad that what we do today has a bigger cause. And it's very amazing how very similar algorithms can bring so much value in so much different fields, all around predictive analytics. Steve: Awesome. Yeah, I think your passion is quite inspiring. It comes through loud and clear. And I really appreciate you being on the podcast today. It's been a pleasure. So thank you very much and good luck with everything that you're doing! Kira: thank you so much, Steve! Definitely.